Prosecutors say a Frenchman being held over a fatal shooting at the Jewish Museum in Brussels admitted the killings in a video. Mehdi Nemmouche, 29, was arrested at a train station in Marseille on Friday. Paris prosecutor Francois Molins said the suspect had claimed responsibility for the 24 May attack, which left three people dead and another critically ill. He said Mr Nemmouche had spent over a year in Syria and had links with radical Islamists. 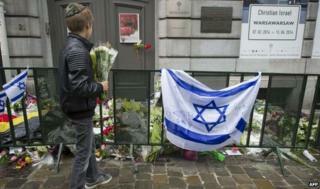 Security was tightened at Jewish sites across Belgium following the shooting. Police found Mr Nemmouche had in his possession a Kalashnikov rifle and a handgun believed to have been used in the attack, the Paris prosecutor told a news conference on Sunday. With the weapons was a white sheet emblazoned with the name of the Islamic State of Iraq and the Levant, a jihadist group fighting in Syria, according to Mr Molins. Mr Nemmouche was also said to be carrying a camera with a 40-second video showing the two guns and a voice recording, claiming responsibility for the killings and expressing regret that the device had not succeeded in capturing the shooting. French President Francois Hollande earlier said France was determined to stop "jihadists" from carrying out attacks. "We will monitor those jihadists and make sure that when they come back from a fight that is not theirs, and that is definitely not ours... they cannot do any harm," he told reporters. Mehdi Nemmouche was radicalised in prison, but it is his Syria connection that will most concern governments in Europe. He is believed to have spent most of last year there. At the time of his arrest, authorities say he had a machine gun wrapped in the flag of the Islamic State in Iraq and the Levant (ISIS), a group so extreme, with its beheadings and crucifixions, that it has even been disowned by al-Qaeda's leadership in Pakistan. British government officials have long been warning of the growing risk of young men going off to Syria to join jihadist groups then returning to Britain to carry out attacks at home. Already the number of Syria-related arrests in the UK this year is greater than for the whole of 2013. An estimated 500+ Britons have gone to Syria to fight, while the number for Europe as a whole may now exceed 3,000. A small minority have been killed on the battlefield but analysts say that historically the proportion of returning jihadists who go on to commit acts of violence in the country of departure is around one in nine. They believe that Syria is so easy to reach from Europe that the ratio may even be higher. Mr Nemmouche, a French national from the northern town of Roubaix, was arrested at the Saint-Charles train station in Marseille as he was getting off a coach during a random drugs search. The coach was travelling from Amsterdam via Brussels. He is being held on suspicion of murder and attempted murder. The 29-year-old was in prison for five years in France for robbery and released in December 2012, Mr Molins said. In prison he is known to have moved in radical Islamist circles, and went on to spend a year in Syria from January 2013. He returned to Europe in March. In a near simultaneous news conference in Brussels, Belgian federal prosecutor Frederic Van Leeuw said police had carried out raids in the Courtrai region of Belgium on Sunday morning, where the suspect is believed to have spent time. Three people were killed outright when a gunman opened fire at the museum in the busy Sablon area of the Belgian capital eight days ago. They were an Israeli couple in their 50s, and a French female volunteer. Israeli Prime Minister Benjamin Netanyahu and President Hollande also condemned the killings.